ZAGGsparq 57% Off Holiday Sale: Cheapest Price Ever! Looks like ZAGG is at it again with another last minute Christmas sale! This time around it’s on the latest ZAGGsparq iPhone backup battery charger. The ZAGGsparq stores up to four full iPhone charges, plus the dual USB ports will allow you to charge pretty much everything else. This is the price you’ve been waiting for! iPhoneinCanada.ca Helps You Save 20% More! The regular price of the ZAGGsparq is $129.99. The current sale price is $69.99 ($60 off!). 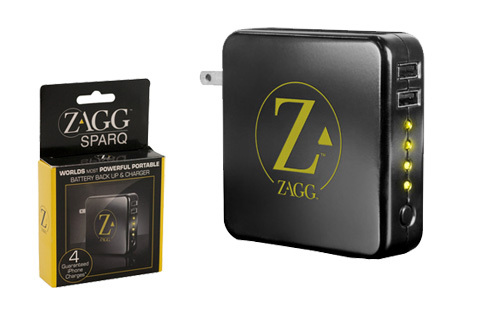 This is the cheapest price you’ll ever get for the ZAGGsparq! That is even better than their previous 50% off sale! So if you don’t want to worry about battery woes ever again, the ZAGGsparq could be the charging solution you’ve been waiting for! We have some test units on the way, so stay tuned for the review. All you last minute shoppers will love this deal– but definitely act quickly before the sale ends!